How have I not shared this banana cake recipe yet!? This is like basic recipe necessity right here! 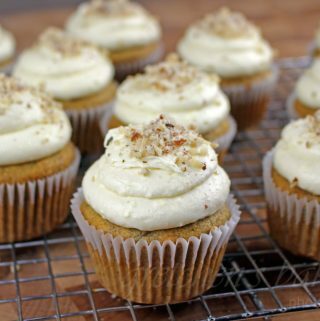 Not only does this recipe make the most moist, delicious banana cupcakes, but you can bake the batter into cake pans for the best banana layer cake ever! But today I am sticking with cupcakes since I’m on a cupcake kick lately; and topped with my cream cheese icing recipe… well what more is there to say? 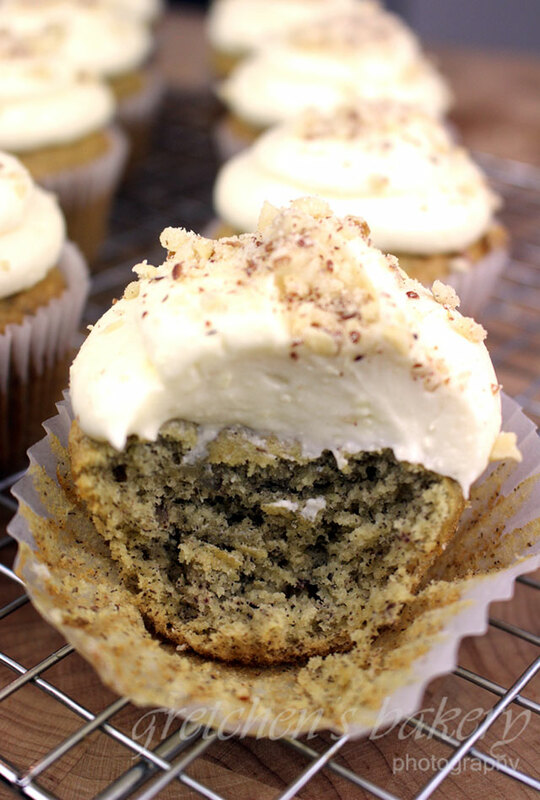 Vegan Banana Cupcakes with Cream Cheese Icing. Nuts or no nuts, this recipe is going to be one of your forever favorites, I promise! Cream the vegan butter with the sugar on medium high speed until light and fluffy this will take approximately 3-4 minutes. Sift the flour, baking powder & soda, the plant based egg *if using* with the salt and cinnamon. Add another ⅓ of the dry ingredients while mixing on low, then add the remaining milk and then the last of the dry. Un-iced cupcakes can be stored at room temperature for up to 4 days in an airtight container. I dont know much about gluten free, except that when it is GF AND vegan, it is not always a straight sub to GF flour, sometimes the fat needs to be adjusted AND if the GF mix has gums in it, this makes a difference also. These cupcakes look delicious! What do you suggest we use in place of the plant-based egg until it’s available? I am using my preferred egg replacer the Plant Based Egg by freely Vegan. This egg replacer allows me to add it dry to the dry ingredients. If you use another egg replacer of your choice or even flax to substitute for 1 egg, you will add the reconstituted egg replacer to the recipe after the creaming in the first step, then proceed with the recipe as written. Followed this recipe exactly, except I used a flax egg and I found that one large banana was not big enough to make one cup mashed. Baked it in an 8X8 Pyrex at 350 for 40ish minutes longer to compensate timewise. Used a vegan chocolate frosting recipe I found elsewhere; the recipe required a lot of modification, so it’s not worth sharing; however, it still tasted awesome on this cake (I added a tiny bit of rum). Will probably try the cream cheese frosting at some point, but without the cream cheese frosting, I almost always have all these ingredients on hand. Yes since all bananas grow differently its always hard to say how many it will take to fill one cup which is why I listed it as 1 cup, thanks for the feedback! Yes, thanks for listing 1 cup of banana – I hate ambiguous cooking instructions! My fiance and I finished off this cake in one night. He asked me to make another.